There is an old kid’s joke, “How do you eat an elephant?” The answer, “One bite at a time”. Wanting to start prepping is a lot like this. You do not have to do it all at once. Don’t start by just running out and buying stuff. Start by doing some studying, then make a plan and follow it. Planning is the most important thing you can do. I have seen people run out and accumulate large amounts of supplies without a plan. They often fall for the first charlatan that comes along and are taken advantage off. They buy inferior food or other products and end up having to replace them. Advice for Beginning Preppers. This will often result in wasted time and money and large holes in their preps. As you start prepping, you will find many questions you may not be able to answer. Start by accumulating knowledge; get a good prepping book, read some blogs, and then start out slow. Don’t be in a rush to spend your money. The type of supplies you gather and the skills you develop will depend to some extent on the type of hazards you may face. These could include economic collapse, earthquakes, tidal waves, nuclear warfare, looters, or terrorism. The following steps will help you decide. Step 1. Identifying hazards – What are the hazards in your neighborhood or geographic area? Do you live on an earthquake fault? Are you in a flood zone or an area of high fire danger? Are there major highways or railroad routes (which could cause chemical spills or explosions) near your home? Do you live close to a military base or major government facility? Is there a nuclear power plant near you? Once you start looking, you may be surprised at the hazards that exist near you. Are your reasons for preparing based on your religious beliefs? Do you fear our government? Are you concerned about economic collapse, or pandemics? Your reasons to start prepping could include several of the above-mentioned ideas or be as simple as wanting three to five days of supplies for fear of earthquakes or severe weather. Once you have answered these questions, go to step two. Step 2. Now that you have a better idea of the hazards that are around you and what you are preparing for, study and decide for what period of time you need to stock supplies and whether or not you intent to bug in or bugout. In my opinion the only time to bug out is when it is more dangerous to stay than to leave. Bugging in or bugging out, Bugging Out vs Sheltering in Place is Always a Controversy. Are you planning to accumulate a three-day supply or a year’s supply of food? I personally believe that you should stock at least one-year’s supply of the necessities of life. I consider this a minimum. What are your most important needs? Normally this will consist of good water, food, heat, or fire for cooking and shelter. A big part of determining your needs will depend on where you live. Are you in an urban or rural environment? Do you reside in the hot dry desert of the southwest or a cold northern state? Once you have determined the period of time for which you intent to store food, water and other necessities, you need to decide what to buy and how to prioritize your spending. 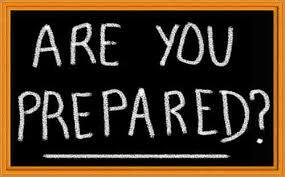 Tomorrow we will discuss the next steps you need to take to start prepping. Good stuff. It’s always good to go back to basics to check your faults.